Welcome to Garden Girl Soaps! 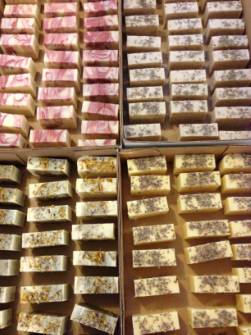 All Garden Girl Soaps are lovingly handcrafted one small batch at a time using the old-fashioned, cold-processed method. We believe in using only all-natural, cruelty-free ingredients in our products. No synthetic colorants, fragrance oils or animal fats are ever used. As often as possible, herbs and botanicals from Garden Girl's own herb garden are incorporated into each unique recipe. Our soaps provide a rich lather that will leave your skin feeling clean, but never dry, because homemade soap retains its natural glycerine which acts as a humectant to actually attract moisture to your skin. Then, we "superfat" each bar with shea butter or hemp oil to make it ultra moisturizing. Not only will your skin look and feel good, but you can feel good knowing that you are using only the best all-natural ingredients on your sensitive skin. Every bar of Garden Girl Soap is hand-cut so shapes and sizes may vary...but each bar weighs at least four ounces. Varieties available do change from time to time, so please be sure to check back often. If you ever have any questions or suggestions, please feel free to contact us. We'd love to hear from you!